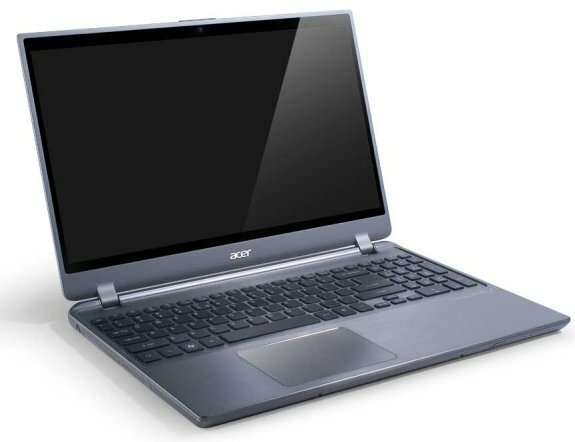 Acer introduces its Timeline Ultra M5 ultrabooks. Available in 14" and 15.6" versions, these Intel Ivy Bridge based systems feature NVIDIA discrete graphics and come as thin as 0.81 inches with a weight as little as 4.3 pounds. Acer America today announced the Aspire Timeline Ultra M5 line of Ultrabooks in the U.S. Slimmer and lighter than earlier generations of the Timeline series, the new Timeline Ultra models are just .81 inches thin, weigh as little as 4.3 pounds and offer the best of both worlds - a slim, lightweight design, larger displays, all-day battery life(1), and powerful Intel and NVIDIA technologies - making them some of the most robust and versatile Ultrabooks on the market. The ultra-thin profile of the Ultra M5 Series delivers a minimalist, modern look. The stylish silver cover is made of an aluminum alloy that not only looks modern and elegant, but adds to the system's overall sturdiness. The 15.6-inch models include a sleek edge-to-edge display that keeps the LCD screen smooth and streamlined. A full-size chiclet keyboard with an independent standard numeric keypad makes typing more comfortable and increases productivity. These no-compromise Ultrabooks provide up to 8 hours(1) of computing on a single charge via the PowerSmart long-life battery pack which provides up to three times longer battery life cycles than traditional batteries (1,000 vs. 300 cycles). These batteries also maintain 80 percent capacity after the 1,000 cycle count, which means the battery will last longer, reducing the need to replace it (4). In addition, advanced thermal technology keeps users comfortable even when the Timeline Ultra is placed on a lap. Featuring the innovative "Acer Green Instant On" and "Acer Always Connect" technologies, users can manage their multimedia and data on all their devices at anytime, anywhere. Acer Green Instant On resumes the Timeline Ultra's computing session from sleep in less than 2 seconds and from deep sleep in 6 seconds(2); the 20GB SSD drive returns to the PC's state just as it was left. Turn the PC back on, and any websites, emails or documents that were left open are instantly restored and ready. Acer Always Connect connects to the web in 2.5 seconds(3) by remembering previously used Wi-Fi spots. When they come within range again, the Timeline Ultra M5 instantly connects to the Internet, so consumers can immediately access instant messaging, Internet services and email after the system resumes. Depending on configuration, the Timeline Ultra Series offers 3rd Generation Intel® CoreT i3 or Core i5 processors, NVIDIA discrete graphics and 14-inch LCDs or 15.6-inch edge-to-edge displays. All models include a 2-spindle design (DVD drive and hard drive). A 500GB hard disk drive(5) offers plenty of space for large files, while a 20GB integrated solid state drive enables instant-on capability. Featuring two USB 3.0 ports, consumers can charge external devices when the Timeline Ultra is in sleep, hibernation or even when it's turned off. Transfer speeds will be up to 10 times faster than older generations of USB(6). For those that like to play, the Timeline Ultra M5 Series includes models with top-of-the-line entertainment enhancements, maximizing the value of these super slim designs. For powerful gaming or video editing, NVIDIA GeForce GT 640M LE dedicated graphics powers the latest games with amazing special effects and incredible detail. HD video and photos can be created quickly with GPU-accelerated software and popular photo applications. In addition, NVIDIA Optimus technology delivers the performance of dedicated graphics when needed, and conserves battery life when not in use. Backlit keyboards make it easy to game or type in low light conditions, while the professionally-tuned Dolby® Home Theater® v4 and premium speakers deliver high volume, clear dialogue and crisp sound effects for games, music and movies. While still maintaining a thin and light design, the Timeline Ultra M5 Series features a built-in optical drive, allowing consumers to burn file copies of their data for safekeeping, or pop in a disk to enjoy movies or music. An HDMI port allows for easy connection to a big screen TV or monitor. And whether users are managing a large or small library, Acer clear.fiT makes it easy to manage, store, share, and enjoy media among any clear.fi-enabled devices, in any room throughout the home. Staying in touch with friends, family and co-workers across the miles is easy with Acer's advanced 1.3 megapixel HD webcam. It enables crystal-clear video chat sessions and snaps still pictures in HD, providing high pixel density for amazing video image quality at 24 frames per second. Whether the Timeline Ultra M5 is for home use to keep track of finances and other secure personal information or for business to access corporate data and applications, Intel Anti-Theft Technology(7) (Intel® AT) allows owners to quickly and easily disable their lost or stolen Ultrabook remotely from anywhere in the world, making the computer useless to thieves. Because the technology is built right into the BIOS, it's activated as soon as the machine is turned on-even before startup. It works without Internet access and is hardware based, so it is tamper resistant. If the Timeline Ultra M5 is lost or stolen, a local or remote "poison pill" can be activated that renders the laptop completely inoperable. Once it's returned, it can be easily reactivated without harm to the notebook's data or digital content. This feature is available on all Timeline Ultra M5 models, and requires a service subscription from an Intel AT-enabled service provider. All models in the Timeline Ultra M5 Series also include Acer AntiTheft, a free software based solution. When enabled, the Ultrabook recognizes the distance from a designated WiFi signal source, and if the system moves beyond 10 feet of the signal, a loud siren will sound from the Ultrabook's speakers. This feature can easily be enabled and disabled, and will be especially useful when traveling. The Acer Aspire Timeline Ultra M5 Series of Ultrabooks will be available at http://us-store.acer.com/ and leading retailers across the U.S. beginning at the end of June. Prices begin at $679.99 and range up to $829.99. Customers who buy an Acer Ultrabook PC pre-loaded with Windows 7 Home Basic, Home Premium, Professional or Ultimate will be eligible to purchase Windows 8 Pro for only $14.99 (U.S.) ERP. The Offer is valid June 2, 2012 through January 31, 2013, for complete details visit http://windowsupgradeoffer.com.